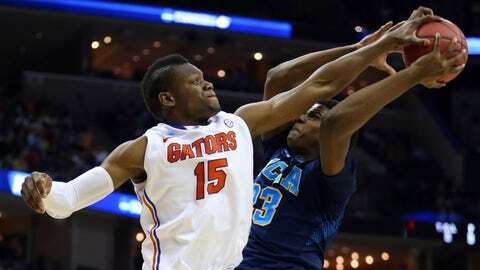 Gators seniors, including forward Will Yeguete, have reached the Elite Eight in each of their years at Florida, but have yet to advance to the Final Four. MEMPHIS, Tenn. — The Billy Donovan slogans and themes have mounted like the Florida victories this season, but center Patric Young went into the archives Friday when asked to reflect on just what the current crop of UF basketball players — led by this special quartet of seniors — set out to do when it first gathered as a team like September. "Coach Donovan uses a million analogies and this one was a good one: laying the soil for the season," Young said. "We laid good soil. Even though things were kind of tough, guys were still locked in, buying into the system, working every day and staying in the moment." Now, before we analyze the present moment, let’s talk about some prior moments. Specifically, the final game of the last three UF seasons, each of which ended in thorough frustration one win shy of the Final Four. On that subject, the top-ranked and top-seeded Gators (35-2) weren’t particularly interested in reminiscing while speaking to Saturday’s 6:09 p.m. date with surprising 11th-seeded Dayton (26-10) in the NCAA South Region Tournament championship game at FedEx Forum. It’s been UF’s ability to focus on the present that’s carried the Gators to a school record-tying number of victories, including 29 straight, so why would they deviate from that mindset now? "Everybody knows about our past," senior Will Yeguete said. And none of the Elite Eight letdowns of the those three years — the late-game collapses against Butler in 2011 and Louisville 2012, or the 20-point blowout against Michigan last year — have anything to do with the current crop of Gators or sky-high Flyers or what will happen between the lines when the ball is tipped Saturday night. "We know Dayton is a good team," senior point guard Scottie Wilbekin said. "Those teams we played in the past were good teams as well, but what happened in the past has no bearing on what’s going to happen [this time]." From 2011 through 2013, the Gators had seven chances to cut down nets in tournament settings and managed to do it just twice; both times at home. In searching for answers as to why his team had such trouble finishing tasks in pressure-packed situations, Donovan vowed his 2013-14 team would be closer, tighter and more personally invested in one another than ever. It wasn’t easy, especially when juggling the much-publicized summer suspensions of Wilbekin and sophomore forward Dorian Finney-Smith that carried into the regular season, plus the midseason addition of freshman center Chris Walker. It took time, but more importantly it took trust on the part of everyone in the program. The results have manifested themselves time and time again in down-the-wire, clutch and close-out play on the court, with Wilbekin, the 2014 SEC Player of the Year, the heartbeat of everything the Gators do. Now comes the penultimate finishing opportunity: The Elite Eight. "We still have two big goals in front of us," sophomore guard Michael Frazier II said. Blocking the way is a Dayton team that bears many of the same traits as the Gators, starting with their closeness and connectivity. The Flyers had to weather a 1-5 start in the tough Atlantic-10 Conference, rallying around Coach Archie Miller and one of the deepest, most versatile rosters in the country to become the giant-killers of the tournament, already with wins over 6-seed Ohio State, 3-seed Syracuse and 10-seed Stanford. "No matter if you respect us or don’t respect us, these teams eventually have to play us," Dayton junior guard Jordan Sibert said. "We want to show that we can compete against anybody." As far as Donovan is concerned, the Flyers have done that. In the UF coach’s mind, there are no Cinderellas in NCAA play; not at this stage of the tournament; not after ousting three teams that were seeded higher. Hey, if seeding mattered, Dayton would have been out of the tournament in the first round. "People try to create that kind of perception and it’s really an untrue perception. They’re an outstanding team," Donovan said of the long-shot label attached to the Flyers. "For us, it’s always about the opponent and what they do." The Flyers have crashed the tournament with a roster that in any given game can go 11 and 12 deep. All 12 scholarship players have at least one game when they’ve scored double-figures. Against Stanford, forward Kendall Pollard came in averaging two points a game, but went 5-for-6 from the floor to finish with 12 points. That was Dayton in microcosm. Eleven Flyers played at least seven minutes in the game, with their bench outscoring the Cardinal’s 34-2. And they’re looking to run and shoot 3s. Always. "The thing that makes them unique and special is they’e gotten great production from a lot of different people a lot of different points of time in the game," Donovan said. "Whether’s it’s offensive rebounds or hustle plays, somebody knocking down a 3, somebody making a steal or getting steal, they’ve got a lot of versatility and depth that they use to their advantage." But they have something else that the Gators can relate to. "Our togetherness has defined our team," guard Vee Sanford said. The stronger bonded team will be the one that’s playing harder and more desperate. The Gators made a promise to each other last summer that they would be that team. They strayed from that in the tournament opener, a lackluster showing in a win over 16th-seeded Albany, but that outing, and the realization that came with it, hit home. This team is great when playing together, but very ordinary when it isn’t. That’s been clear for 37 games, and the 115 since UF’s last loss. "It’s been a joy now to play with these guys and spend time with them," Wilbekin said. And goal is be together for another weekend. A really, really big weekend. History: This will mark the first meeting between Florida and Dayton, but UF has a 21-9 record against teams from the Atlantic-10, including a 5-2 mark under Coach Billy Donovan with one of those wins coming earlier in the season against Richmond. The Gators last played an A-10 team in the NCAA in 2006 when they defeated George Mason 73-58 in the Final Four. Pre-game storyline: UF’s four-man senior class is making its fourth straight trip to the Elite Eight, having lost each of the previous three. The Gators blew double-digit leads inside of 10 minutes to both Butler (2011) and Louisville (2012) in regional title games, then were destroyed from the opening tip last year against Michigan. UF, ranked No. 1 in the nation, the tournament’s overall No. 1 seed and winner of a school-record 29 in a row, is seeking the fifth Final Four berth (1994, 2000, ’06, ’07) in school history. About the Gators: One of the nation’s top defensive teams during the regular season, the Gators are allowing just 54.3 points per game in six postseason games and 38.7-percent shooting. Only three teams have hit the 70-point mark against Florida this season, none since a 75-71 win at Ole Miss on Feb. 22 (11 games ago). … Senior point guard Scottie Wilbekin (13.1 pgg, 3.7 apg) needed a half to get untracked against UCLA, but scored 10 of his 13 points after intermission and for the second straight game made super-clutch baskets in the final minutes to help UF seal a tournament win. … Sophomore guard Michael Frazier II (12.7 ppg, 3.6 rpg) was in a 5-for-21 career NCAA slump from 3-point range until his sizzling 5-for-8 show from distance against UCLA that helped get the Gators off to a fast start. … Senior center Patric Young (10.8 ppg, 6.2 rpg) dealt with foul trouble throughout the UCLA game, finishing with just four points and three rebounds. About the Flyers: They’re in the Elite Eight for the first time since 1984 when they lost to eventual national champion Georgetown 61-49. Dayton is seeking its first Final Four appearance since 1967, when the Flyers lost to Lew Alcinder and UCLA in the NCAA title game 79-64. … They’re 24-3 when three or more players score in double figures and 2-7 when it is two or less. … During the regular season, Dayton defeated Gonzaga, California (which beat Arizona) and won at Ole Miss in overtime. The Flyers have won 13 of 15 coming into the game. … The coach is Archie Miller, younger brother of Arizona coach Sean Miller, who is 63-37 in three seasons. … The Flyers are shooting 46.5 percent from the floor as a team, 37.5 from 3, while giving up 43.7 and 33.2, respectively, on defense. … Junior guard Jordan Sibert (12.5 ppg, 3.5 rpg) is one of two Flyers who likely will play as many as 30 minutes. The Ohio State transfer is shooting 43 percent from 3-point range — and has deep range. … The other high-minutes guy is 6-7 forward Devin Oliver (11.9 ppg, 7.5 rpg). He took it to a much bigger Stanford team Thursday, finishing with 12 points, 7 rebounds, 3 assists. … Forward Dyshawn Pierre (11 ppg, 5.6 rpg) is shooting 49 percent from the field and has five double-doubles this season. * .694 – Dayton’s winning percentage against BCS conference basketball teams the last seven years, a mark that in addition to the tournament run through Ohio State, Syracuse and Stanford also includes wins over Alabama, North Carolina, Minnesota, Louisville, Minnesota, West Virginia and Marquette. * 4 – Freshmen in NCAA Tournament history to record 10 assists in a Sweet 16 game. Kasey Hill joined that short (and impressive) with his performance against UCLA and now sits alongside Michigan State’s Ervin "Magic" Johnson (1978), Maryland’s Keith Gatlin (1984) and California’s Jason Kidd (1993). * 8 – Consecutive wins for the Flyers against the SEC. * 115 – Made 3-pointers for Frazier this season after Thursday breaking Lee Humphrey’s single-season mark of 113, set in both ’06 and ’07. * 450 – Career wins at Florida for Donovan. That’s an average of 25 per season. Watch for it: The Gators have a significant size and bulk advantage on the Flyers and will want to get the ball to Young and 6-8 Dorian Finney-Smith to try and get things going in the post. And, of course, they’ll be looking to get the game going up and down the floor, preferably with live-ball transition turnovers the likes of which they need to avoid against a team looking to capitalize on miscues and missed shots.